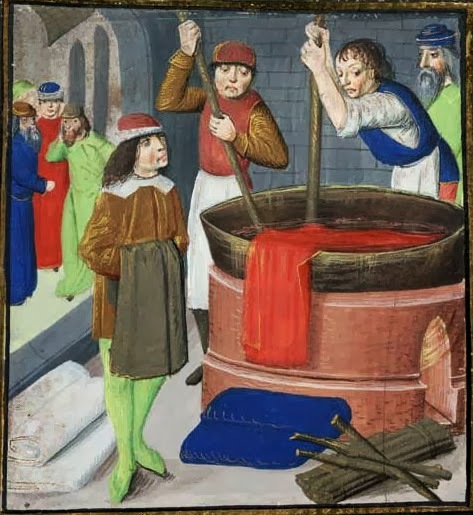 Dyeing wool cloth, from "Des Proprietez des Choses"
In his book on glassmaking, L'Arte Vetraria, Antonio Neri presents a number of recipes for paint pigments used to decorate finished glassware. 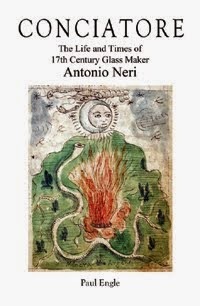 One recipe (#119) is for crimson red, from kermes [kur-meez], prepared by a method of his own invention, which he developed while working in Pisa in 1602–1603. Since antiquity, throughout Europe and the Near East, kermes was a highly valued red colorant because it formed a pigment that resisted sunlight, humidity and temperature. Kermes red can be found in prehistoric cave paintings, Egyptian scrolls and the robes of cardinals and kings. Words in many languages used to describe bright red, "crimson" and "carmine" among them, are derived from the name "kermes." The pigment is produced from the bodies and eggs of a small type of insect that feeds on the sap of evergreen oak trees throughout the Mediterranean region. In the spring, the female kermes insects and their eggs were harvested. The small eggs surrounding the edges of the insect body resemble kernels of grain, hence the expression "dyed in the grain." For medicinal purposes, kermes pastes were used to disinfect wounds and served as an effective contraceptive. To extract the color, Neri starts with a flask of "the very best grappa," which is a potent kind of liquor made by distilling the skins, seeds, stems and pulp of grapes, leftover from wine making. To this, he adds a pound of alum and one ounce of the dried kermes insects, ground finely and sifted. He agitates the mixture, at which point the grappa will "color beautifully" and then lets it sit. After four days, he adds four ounces of alum dissolved in water and pours the mixture into a stocking that has been sewn into the shape of a cone. The stocking hold most of the color, while letting the grappa pass through. Alum is another material used since antiquity. It was widely available in Neri's time as a mined mineral, which could actually be several different chemical species with similar properties. Today, chemists know it as a "flocculant"; it neutralizes the electrical charge of finely suspended particles in a liquid, allowing them to stick together and fall to the bottom. This is the secret to Neri's method, although he was not thinking in modern chemical terms, he did know that the alum precipitated the pigment from the liquid allowing it to be collected and dried. Do not spread it too thickly, because then it will not dry quickly. When there is too much moisture it will mildew, and make an ugly color. When a tile has absorbed a lot of moisture, take another new tile. In this manner, it will dry more quickly. When it is dry, remove the coating from the linens. This will be a good lake for painters, as I have made many times in Pisa. Take note that if the color is too strong you should use more roche alum and if it is too weak use less alum so that the color is according to your taste, and desire. Through the fifteenth century, kermes was among the most sought after pigments, but by Antonio Neri's lifetime, its use was declining in favor of a new insect-based red called cochineal that Portuguese traders brought back from Mexico. Cochineal bugs inhabit the prickly pear cactus. They give a more intense color and eventually replaced kermes throughout Europe.